Many bands these days are referring to themselves as cults. Plenty of groups call their live events rituals. It’s almost like 666 and upside down crosses aren’t attention-getters anymore, so to really hammer home how dark the music is, the bands and shows and records are given these highfalutin titles just to garner attention. And usually it’s all hollow silliness. 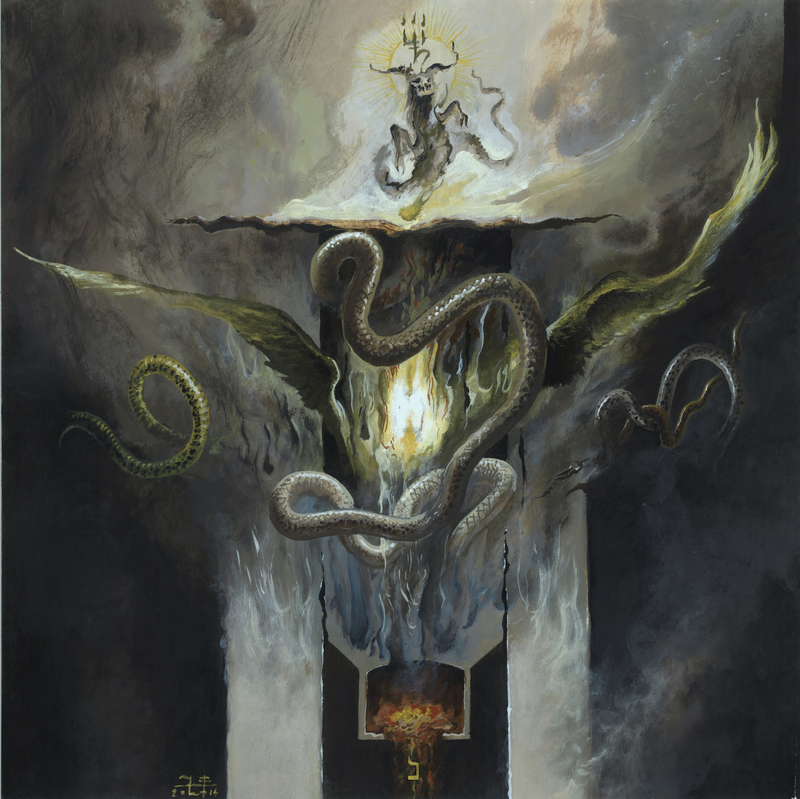 Then there are bands such as Nightbringer, the long-running black metal establishment that hails from Colorado that sounds like, and I’d say are, the real thing. Ever since their formation 15 years ago, the band has offered works that don’t just sound like a bunch of musicians plugging in and trying to conjure darkness. They sound like they’re pulling their sounds and melodies and words form their souls, from their worship, and from their hearts. Their records, including their devastating new one “Ego Dominus Tuus,” the follow-up to 2011’s “Hierophany of the Open Grave,” don’t serve to make the world a better, brighter place. Oh no. They’re here to invite death, pay homage to the dark forces of the universe, and offer up their art as a sort of sacrifice. Or, yes, a ritual. Some may still scoff and these ideas and write it off as a cool marketing tool. If that suits you, then fine, but all you have to do is take a ride with the band on “Ego Dominus Tuus,” or have traveled along with them on their entire journey, to know something genuine is going on here. I am not an expert on any level pertaining to the band’s subject matter. Their form of orthodox black metal and drive to understand the hidden mysteries of life and death affects me purely on a musical level, and certainly I can appreciate what the band is striving for on their records. I won’t make a fool of myself trying to dissect the ideas going on here. Those who are on the same path as these gifted players–Naas Alcameth (vocals, guitar, bass, synth), Ophis (guitar, bass, vocals), VJS (guitar, bass), as Ra’d al-Iblis (vocals), Menthor (drums)–surely can reach out along their way to enlightenment and get an even greater degree of connection from these captivating, mesmerizing 10 songs that stretch out over a mind-altering 71 minutes. “Prayer of Nephal” is a rather fitting opener for the record, as it sounds literally like what the title says it is. Weird noises, chanting, and a trancey atmosphere lead right into “Et Nox Illuminatio mea in Deliciis Meis,” the first of a number of elaborate, dramatic, challenging cuts that’ll take you for a loop. Over 8:59, the band goes through dizzying melodies, grim chaos, and harsh, creaky growls that sound as terrifying as they do transcendent. The music is piercing and spastic, and it leads to nightmare organs at the end that bleed into “Lantern of Eden’s Night.” Violent shrieks erupt right away, with infernal madness being spread from one end of this track to another. Howls are offered up to Lucifer, chilling speaking spills in, and the music rains down fire and burns everything to a crisp. “Things Which Are Naught” fades in from the murk, with riffy tyranny blasting through it, some slower, doomier parts making things even more bleak, and evil and captivating sounds to shake up your guts. “I Am the Gateway” runs 7:33, and it’s a dramatic serving that never lets go of its stranglehold. There are cries to dark forces, melody that floods the plains, more frosty organs, and an incredible final segment that breathes a world of fire. “Call of the Exile” lets noise hang in the air like a cloud of smoke, and behind all of that, cries arrive from the night and seek answers. The track, while longer than four minutes, is something of an interlude or bridge into what’s next, that being “Where Fire Never Dreamt of Man.” The track begins dusty and mystical, like it’s pulling its inspiration from centuries ago, and the vocals are more like a speak growl for much of its run. As the cut progresses, it really breaks open, with the band storming full speed ahead. “The Witchfires of Tubal-Qayin” contains devastating drumming that turns your bones to dust, warped playing that’ll cause your head to spin, muddy and vicious guitar work, and words about sacrifice and final judgment that could sober you to the reality of total destruction. “Salvation Is the Son of Leviathan” begins like a dark thunderstorm that brings oppressive rain and mars your vision, and it remains pretty bizarre through its 6:17 run. Odd voices swirl in the chaos, guitars burn, and the stage is set for the cataclysmic closer “The Otherness of Being,” a 12:56 epic that finishes off Nightbringer’s visions. The guitars boil and give off heat, while the pace erupts and charges ahead heavily. The melodies are as majestic as anywhere else on this record, the shrieks are harsh and fierce, and the song cascades downward, like it is spraying shards of glass everywhere. All of the elements keep building to the climax, and the band puts a big finish on the end of the record like they’re ensuring this world they helped create is nothing but dust when they’re finished. Nightbringer’s music is a special, unique brand of blackness, and their efforts to travel esoteric waters for greater understanding and to pay homage is both enlightening and kind of scary. There is a commitment to the cause, a pure blackness to what this band does on “Ego Dominus Tuus” that goes beyond what most other artists in their genre attempt. This music is here for you to enjoy, yes, and if you connect, that’s great. As far as the band’s work goes, it would exist and twist and morph whether their congregation was a million or none. That’s because for Nightbringer, this music needs to be here. It’s the only path they can take.